Only about 12%–30% of the energy from the fuel you put in a conventional vehicle is used to move it down the road, depending on the drive cycle. The rest of the energy is lost to engine and driveline inefficiencies or used to power accessories. Therefore, the potential to improve fuel efficiency with advanced technologies is enormous. Energy requirements in this diagram are estimated for stop-and-go city driving using the EPA FTP-75 Test procedure. In gasoline-powered vehicles, most of the fuel's energy is lost in the engine, primarily as heat. Smaller amounts of energy are lost through engine friction, pumping air into and out of the engine, and combustion inefficiency. Advanced technologies such as variable valve timing and lift (VVT&L), turbocharging, direct fuel injection, and cylinder deactivation can be used to reduce these losses. Diesel engines have inherently lower losses and are generally one-third more efficient than their gasoline counterparts. Recent advances in diesel technologies and fuels are making diesels more attractive. Energy is lost in the transmission and other parts of the driveline. Technologies such as automated manual transmissions (AMTs), double-clutch, lock-up transmissions and continuously variable transmissions (CVTs) can reduce these losses. Electrical accessories such as seat and steering wheel warmers, lights, windshield wipers, navigation systems, and entertainment systems require power and lower fuel economy. Losses from accessories such as electric door locks and signal lights are minuscule, while losses from seat and steering wheel warmers and climate control fans are more significant. The water pump, fuel pump, oil pump, ignition system, and engine control system use energy generated by the engine. Any time you use your brakes in a conventional vehicle, energy initially used to overcome inertia and propel the vehicle is lost as heat through friction at the brakes. Less energy is used to move a lighter vehicle. So less energy is wasted from braking a lighter vehicle. Weight can be reduced by using lightweight materials and lighter-weight technologies. Hybrids, plug-in hybrids, and electric vehicles use regenerative braking to recover some braking energy that would otherwise be lost. A vehicle expends energy to move air out of the way as it goes down the road—less energy at lower speeds and more as speed increases. This resistance is directly related to the vehicle's shape and frontal area. Smoother vehicle shapes have already reduced drag significantly, but further reductions of 20%–30% are possible. Rolling resistance is a resistive force caused by the deformation of a tire as it rolls on a flat surface. New tire designs and materials can reduce rolling resistance. For cars, a 5%–7% reduction in rolling resistance increases fuel efficiency by 1%, but these improvements must be balanced against traction, durability, and noise. A vehicle spends significant time idling in city driving (stop and go traffic), using energy to run the engine and power the water pump, power steering, and other accessories. Integrated starter/generator (ISG) systems, like those used in hybrids, eliminate idling by turning the engine off when the vehicle comes to a stop and restarting it when the accelerator is pressed. Energy requirements in this diagram are estimated for the EPA Highway Fuel Economy Test procedure (highway driving with an average speed of about 48 mph and no intermediate stops). Highway driving includes little to no idling. The EPA highway driving cycle (HWFET) includes no idling. 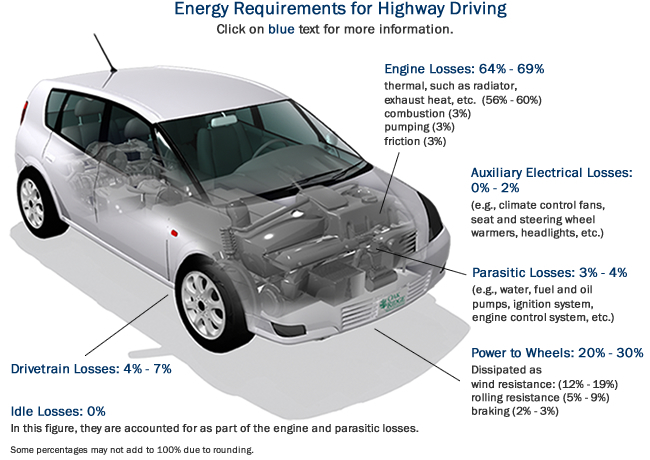 Energy requirements in this diagram are estimated for 55% city and 45% highway driving. See the estimates for city and highway driving for more information. A vehicle spends significant time idling in city driving (stop and go traffic), using energy to run the engine and power the water pump, power steering, and other accessories. Highway driving, however, includes little to no idling. Energy requirement estimates are based on analysis of over 100 vehicles by Oak Ridge National Laboratory using EPA Test Car List Data Files. Thomas, J. 2014. Drive Cycle Powertrain Efficiencies and Trends Derived from EPA Vehicle Dynamometer Results. SAE Int. J. Passeng. Cars - Mech. Syst. 7(4):2014, doi:10.4271/2014-01-2562. Baglione, M., M. Duty and G. Pannone. 2007. Vehicle System Energy Analysis Methodology and Tool for Determining Vehicle Subsystem Energy Supply and Demand. SAE Technical Paper 2007-01-0398, 2007 SAE World Congress, Detroit, Michigan, April. Bandivadekar, A., K. Bodek, L. Cheah, C. Evans, T. Groode, J. Heywood, E. Kasseris, M. Kromer and M. Weiss. 2008. On The Road in 2035: Reducing Transportation's Petroleum Consumption and GHG Emissions. MIT Laboratory for Energy and the Environment, Report No. LFEE 2008-05 RP, Cambridge, Massachusetts. Baglione, M. 2007. Development of System Analysis Methodologies and Tools for Modeling and Optimizing Vehicle System Efficiency. Ph.D. Dissertation. University of Michigan. Carlson, R., J. Wishart and K. Stutenberg, K. 2016. On-Road and Dynamometer Evaluation of Vehicle Auxiliary Loads. SAE Int. J. Fuels Lubr. 9(1):2016, doi:10.4271/2016-01-0901. Rhodes, K., D. Kok, P. Sohoni, E. Perry, et al. 2017. Estimation of the Effects of Auxiliary Electrical Loads on Hybrid Electric Vehicle Fuel Economy. SAE Technical Paper 2017-01-1155, doi:10.4271/2017-01-1155.